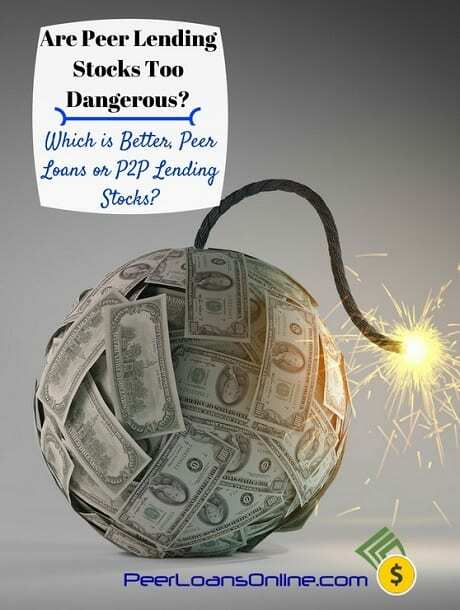 Which is the better investment, peer lending stocks or direct investment in the peer loans? Peer to peer lending not only represents an excellent opportunity for borrowers but a step forward in access for investors. By cutting out the banking middle-man and all the other steps in the loan securitization process, p2p represents a leap forward in finance. I’ve posted several peer to peer lending reviews for borrowers on how to get the best rates. Since the p2p loan process doesn’t need bank branches, the cost can be as much as 4% lower than traditional loans. But its investors that really come out on the new access to peer lending investments. With bond investments paying almost nothing after inflation and stocks starting to get very expensive, peer lending may just be the best performing asset class over the next few years. There’s another way to invest in peer lending, through the stocks of the companies themselves. 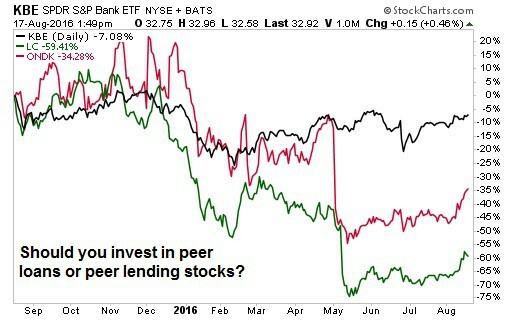 Should you invest in peer loans or peer lending stocks? If you wanted to invest in bank loans before peer lending, you had to buy them from a broker. The broker bought the loans from the bank and everyone marked up the price along the way. Investors were lucky to make any profit at all by the time loans got paid off. By directly connecting borrowers and investors, peer lending has cut the process down to as few steps as possible. Investors fund loans, the peer lending site collects payments and passes them on to the investors. This leap in direct investment has meant investment in peer loans on the Lending Club platform has generated a return of around 7.5% on loans over the last several years. I recently highlighted three Lending Club investing strategies for different types of investors with expected returns ranging from 6% to 12% on loans. Not only have returns been double that of corporate bonds but peer lending investing provides diversification from a stock and bond portfolio. That means your net wealth won’t tumble the next time there’s a stock market crash. Finally, one of the most overlooked benefits of investing in peer loans is the forced discipline on investors. Once you invest in a loan, you’re locked in for three to five years. That may seem like a disadvantage but look at what constantly trading stocks has done for stock market investors. One survey shows that investors earned an annual return of just 2.6% on a portfolio of stocks and bonds over the decade to 2013. That’s well below the 7% return on stocks and even below the 4.6% return on bonds, all because of bad investor behaviors. Avoiding these investor behaviors that lose money is the only way to win the stock market game and its baked-in to peer loan investing. What about Peer Lending Stocks? But there’s another way to invest in peer lending, through the stocks of the peer loan companies. Two peer lending companies currently trade on the New York Stock Exchange, Lending Club and OnDeck Capital. Lending Club (NYSE: LC) is the largest peer lending platform in the world and issued shares in December 2014. I warned investors when Lending Club stock surged to $25 per share that direct investment in loans was a much better deal. Since then, the shares have tumbled 78% while I know investors that have made 12% annually on loans. Much of the recent drop in Lending Club shares is due to some accounting problems they had earlier this year. The stock plunged to $3.44 per share in May but has since recovered to $5.50 per share. Since Lending Club only holds a fraction of the loans it helps originate, through its investment in some funds, investing in the stock is different than investing directly in loans. Investing in Lending Club stock is an investment in the peer lending industry and how its growth has revolutionized lending. Investing directly in loans are more like bonds where you receive interest and principal payments monthly. I do own some Lending Club stock from when it traded at $4.80 per share. The company is changing the way loans are made in America and there is a ton of growth ahead even if the stock started out overpriced. OnDeck Capital (NYSE: ONDK) is another peer lender but originates small business loans rather than personal loans. Shares have also plunged since the company’s 2014 IPO with the stock also falling 78% over the last two years. Shares of OnDeck Capital have been hit more on weak growth rather than the accounting issues seen at Lending Club. The company reported a huge drop in revenue growth and missed profit expectations when it announced its first quarter results in May. I prefer Lending Club stock over that of OnDeck Capital for several reasons. As a small business lender, OnDeck loans will be much more susceptible to the economy than the personal loans on Lending Club. Default rates will increase on Lending Club during the next recession but probably not as high as OnDeck loans. This could make it harder for OnDeck to find investors to fund loans. I am also not a fan of the rates charged on OnDeck loans through their short-term lending. Short-term loans of less than a year can see interest rates of nearly 100% which is lower than payday lenders but still ridiculously high. I understand that business owners sometimes need short-term funding but I think the company’s rate policy could come under pressure from regulators. The chart below shows the performance of peer lending stocks against the SPDR S&P Bank ETF (NYSE: KBE) over the last year. Banking stocks have been under pressure with a drop of 7% but that’s nothing to the 35% and 60% drop in peer lending stocks. Still, companies like Lending Club are changing the way we think about lending and that could mean big profits for investors that are willing to take a chance. If you do invest in Lending Club stock, I suggest doing it as part of a diversified portfolio of stocks on Motif Investing. Motif is one of the best ways to save money investing by allowing you to pay just one commission to buy up to 30 stocks. When it comes down to it, the decision isn’t really whether to invest in peer loans or peer lending stocks. Investors looking to reduce their investing risk from stocks and bonds should definitely hold some peer loans for stability and great cash flow. The decision to invest in shares of peer lending companies should be made apart and depend on your own risk tolerance and outlook for the companies.